Download and Print Your Certificate Today! You’re proud of your expertise and it shows in your quality, original articles. Your dedication builds your audience’s confidence in your credibility and authenticity, as well as leads to your mounting success. 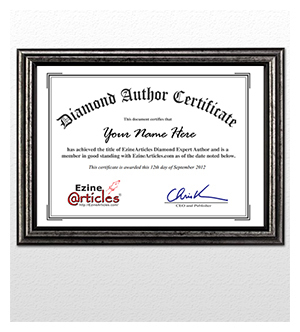 Take pride in your article writing efforts with an EzineArticles Expert Author Certificate! We hear about how publishing on EzineArticles.com has helped Expert Authors every day – from building credibility to amplifying their exposure to getting discovered by mainstream magazines and news outlets. We’re proud of our community of Expert Authors and in return, we have launched our first ever certificate program. Go now and print off your Certificate to show off your EzineArticles Expert Author pride! On behalf of EzineArticles, thank you to our thousands of Expert Authors who continue to provide quality, original articles. Thanks, that’s very thoughtful on your part! Oh my!!! I think this is a new feature added to EzineArticles. I love this innovation. I’m extremely happy. I would be very proud to flaunt my cert and promote EzineArticles on my blog in my next post. I just downloaded my cert now. Thank you very much @EzineArticles. Thank you for the certificate. I noticed it by accident while reviewing and updating my profile. I am currently a Basic Plus Expert Author and looking forward to becoming a Diamond Expert Author. I will also be flaunting my certificate and brazenly wallow (or, the “bask” is the word here) in the limelight it will bring. This new feature will rock. That’s a great news. We can also use these certificates on our websites. Thanks, for such a nice appreciation.. ! I’m very happy. I would be very proud to flaunt my certificate. I just downloaded my certificate now. Thank you very much @EzineArticles. It is always nice to receive recognition for your efforts. I am sure that a the other Diamond authors would agree with me on that. I would just like to say I will be proud to print my certificate off and to give EzineArticles a fraction of the free publicity that they have been kind enough to give me ???? Thanks be to GOD.All the achievement belongs to HIM.Thank you for accepting my article. Awesome guys. Will good on my bedroom wall. Thanks. You never ran out of ideas to make people keep on writing. Marvelous. But I guess the biggest form of recognition is to get discovered by, as you say, some magazine or publishing outlets. The best form of certificate is still that with a dollar sign. I’ve been online for a long time now..but i haven’t seen such a gesture from anybody else. Thanks for your thoughtful appreciation. This makes us more proud and inspired. Thanks also to Ezine team for your support and guidance. Wow, such a nice feature. This is the best way to give credit to article authors. thank you for nice gift, It is motivating gift for the authors. Wow! You made me speechless. I used to love “My.EzineArticles.com” because it had literally taught me how to express ideas by writing. Before, when i didn’t know about EzineArticles.com, i had no clue how to share my information with others. It is very exciting to integrate with social networking from all over the world. But now with the certificate you have boosted my motivation up to sky high. it’s a pleasant surprise for me. If you help me to let me know that how do I add my certificate on my website, that would be great. As always on top in commending your Authors. Well done, and keep up the spirit. This is really great news, everyone strives for recognition and if it is from a reputed name like EzineArticles, what should i say, its icing on the cake. At first I thought it was a bit cheesy to be honest. Now I actually like the recognition. EzineArticles sets apart the high quality articles from everything else, and I’ll be proud to print out my certificate. The development of certificate to expert Authors of your authority is a very good motivation for all lucky enough to be involved. Sir, can I equally download the certificate? Because, my articles are still in the problem status, awaiting my correction attention, which I hope to get done, by the time I,m through with the articles I hope to submit very soon. My question is: With my submitted articles still in the problem status, can I also print the achieved certificate too? The corrections are hoped to be done, as soon as I finish works on the articles I want to submit soon. I’m sorry, however you need to have at least one live article before you are able to print off your Expert Author certificate. A member of our Support Team will be in contact with you regarding your problematic articles. Brilliant, thank you for this new service. really a good news for us! I wish to congratulate all the people attain the success of the certificate achievement as the expert authors with the ezinearticle. However, i equally wish those of us who not have not achieve such a stand a speedy success to achieve same in the near future. It’s a great feature of EzineArticles. I love to hand this certificate to my bedroom. I still need help of the support team,regarding my problematic articles, so that I can at least get one live article to enable me print off my expert Author certificate, as recently done by so many Authors.